China's political advisors met Friday to discuss measures to foster respect for model workers and promote craftsmanship in the country's society. Wang Yang (C, rear), a member of the Standing Committee of the Political Bureau of the Communist Party of China Central Committee and chairman of the National Committee of the Chinese People's Political Consultative Conference, presides over a bi-weekly consultation session of the 13th CPPCC National Committee in Beijing, capital of China, on August 31, 2018. 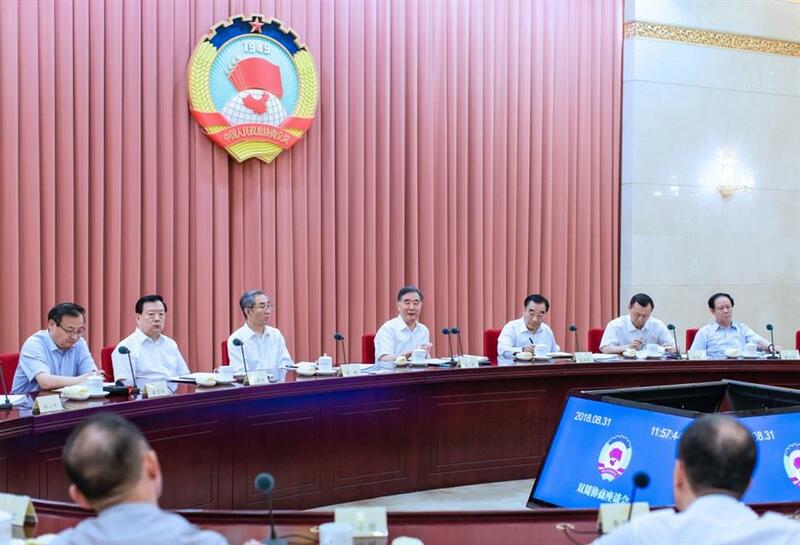 While chairing the bi-weekly consultation session, Wang Yang, chairman of the National Committee of the Chinese People's Political Consultative Conference, said China needs tens of thousands of skilled craftsmen to build a great modern socialist country. "Efforts should be made to foster the culture of respect for hard work and craftsmanship in the society," said Wang. He said relevant services and systems should be improved to boost the sense of fulfillment, pride and honor of model workers and skilled craftsmen, and to inspire them to support and realize the Chinese dream with their work. To that end, participants at the session also suggested ways including improving top-level designs, letting trade unions, employers and society play a part to ensure that model workers and skilled craftsmen have economic security, bright career prospects and high social status.